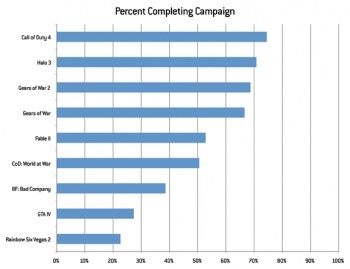 Data collected by Microsoft Game Studios analysts suggests that a staggering percentage of gamers never beat the single-player campaign in the games they play. Achievements aren't just a little extra boost to completionists and fans of a particular game, they're also a surprisingly useful tool for collecting data. For instance, since many games award an achievement for completing the single-player campaign, if you look at how many people have logged playtime in a given game and then see how many of them have that achievement, you'll get a good idea of what percentage of players actually bother finishing the game. In a very intriguing piece over at Gamasutra, Microsoft Game Studios user research expert Bruce Phillips talks about some of the statistics and numbers that he's seen regarding achievement numbers for the most popular Xbox Live games. Phillips looked at the data from more than 14,000 Xbox Live users and put it through the number-cruncher to get his results. Unsurprisingly, few people ever get all the achievements on any given game - Fable II is the highest at what looks like ~45%, while the average player has earned less than 10% of all the Guitar Hero III achievements. What's more interesting, though, is the graph that you see here to the right: What percentage of players have completed the single-player campaign in these various popular games? Call of Duty 4 was in the lead with ~75%, followed closely by Halo 3 and Gears of War 2, dropping all the way down to less than 30% for GTA4 and barely over 20% for Rainbow Six Vegas 2. I'd be willing to chalk up CoD4 and Halo 3 to people who bought the games solely for the multiplayer, but even so those numbers are kind of off-putting. Is it really a good thing that half of the people who ever bought a game like Fable II actually finished it? Was it a matter of difficulty - finding that one controller-breaking part that sours you on the rest of the game - or was it just because some people (or, a lot of people, actually) just got bored? If there was a movie in theaters that had half of the people walking out before the end, it'd be called a dismal failure. What is the failing here with games, and how can developers move to correct it?